This Rockin Jump Orange County review post contains affiliate links. This week we were invited to experience a brand new “Ultimate Trampoline Park” in Orange County – Rockin Jump in Santa Ana. Only 3 months old, this indoor playground offers jump safe, clean fun with ten different attractions including a multi-level rock climbing wall, a massive air-filled stunt bag and X-Beam which is a two person battle with padded jousting sticks. 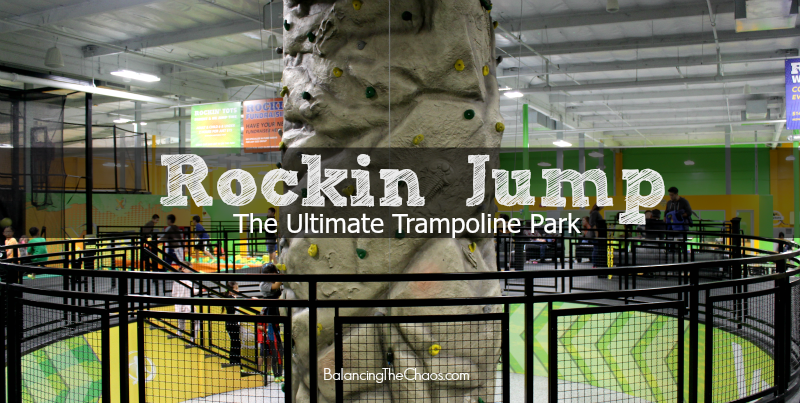 Rockin Jump is jam packed with fun for all ages. Rockin Jump in Santa Ana is 25,000 square feet of bouncing fun centered around a multi-level rock climbing wall that is a hit with the kids. Stunt Bag Arena: Three rows of trampolines launch you into the giant stunt bag arena that cushions your landing. Dodgeball Courts: Two dodgeball courts are available for fun filled competition. Slam Dunk Zone: Two netted trampolines with baskets on each outer wall gives you the opportunity to score baskets on your opponent while jumping. X-Beam: Take on your family member or friend to see who can withstand the two person battle with padded jousting sticks the longest. Rock Tower: A multi-level rock climbing wall gives you different hand holds and strategies up the center attraction. My kiddos enjoyed open jumping at the Main Arena. They were able to do flips, tricks, tumbles and were inspired by the “big kids” doing back hand springs, cartwheels and all kinds of trampoline tricks. They took a turn on X-Beam, but because of their size, weren’t on it very long. The padded jousting sticks were just a little heavy for them, however they did end up giggling and saying they loved it. I think they will enjoy it a little more in a year when they’re a little bigger and stronger. Slam Dunk Zone was calling to my little guy, who was super excited when he was shooting the ball. Not quite tall enough to make it into the basket, but oh so close!. Special jump times are also available for groups like Rockin Tots (for toddlers), Home School and Special Needs Children. Always check their updated calendar for special event times. Rockin Tots: Tuesdays & Wednesdays 9am – 11am and Saturdays 8am – 10am. Special Needs Jump Time: First Sunday, every month 9am – 11am. We counted 4 party rooms of different sizes and another area for taking a quick bouncing break. To get the details, call for exact rate and dates available. Parents, don’t know what to do while the kids bounce? 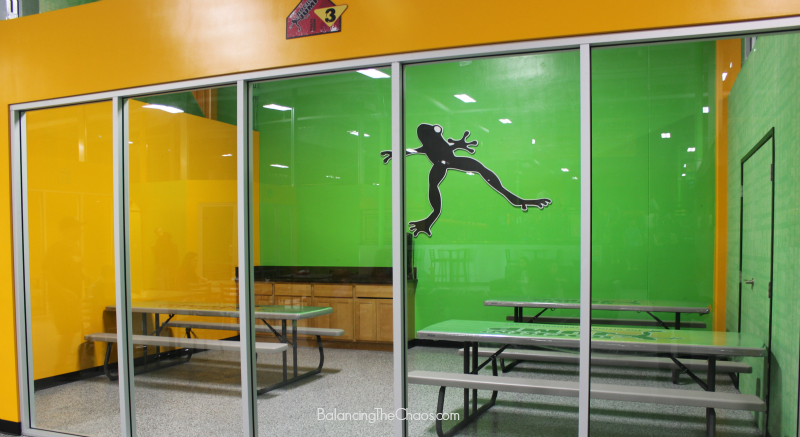 Either grab your own set of amazing green jumping socks and join in on the fun, or relax in the lounging area with 4 flat screen TVs – one that shares camera angles of all Rockin Jump areas so you can keep an eye on your kiddos. Giveaway ends February 8, 2016 at 11:59 PM PST. Open to US Residents 18 and older only. Tickets will be mailed directly to the winner’s home (or mailing) address. Winner will be selected at random and be notified by email. Winners have 48 hours to respond before a new winner is selected. Not liable for unclaimed prizes or fulfillment. Blog has represented each sponsor with the expectation they will fulfill their prize and in a timely manner. No purchase necessary to enter or win; however you must enter for a chance to win. Purchase does not increase chance of winning. Chances of winning depend on number of entries. My opinions are my own and were not influenced by any form of compensation. Facebook, Twitter or any other social media platform are in no way associated with this giveaway. By providing your information in this form, you are providing your information to this blog. I do not share or sell information and will use any information only for the purpose of contacting the winner. Winners can only win once per month. Not liable for unclaimed prizes or fulfillment. I would love to win passes to check this place out. Looking for possible locations to have my sons birthday parties! I would check out the slam dunk zone! slam dunk zone looks fun! X-Beam for us. looks fun. My kids would love the x beam! I want to try the rock wall!!! awesome, thanks for the review. I would of never known about it. The X-beam would be so fun!